Formed in 2010 by five students from the Malmö Academy of Music (all of which had a dream of playing in big arenas in front of large cheering crowds) Swedish rockers State of Salazar started by releasing their debut EP in 2012. That EP was entitled "Lost my Way" and now with their full-length album "All the Way" due to be released at the end of August it looks as if the band is at least on their way towards that goal. Lead by singer and songwriter Marcus Nygren (8-Point Rose, ex-Enbound) the music of State Of Salazar fits in neatly with what Frontiers Music is all about. 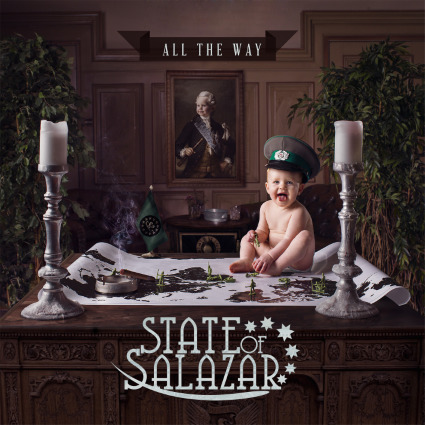 In spite of Marcus Nygren's metal side (8-Point Rose falling on the power metal side of the aisle as it were) the foundation upon which State of Salazar stands is made up of West Coast, AOR and melodic rock bricks making "All the Way" one of those albums that likely will have little appeal to most metalheads. But, for what it is and if we're judging it solely upon it's intended audience then (frankly speaking) "All the Way" has it's strengths chief amongst them strong-songwriting and the performance of lead vocalist Marcus Nygren. Pound for pound Marcus makes for a splendid soft rock vocalist and one could easily see him fronting bands like Journey, Toto, Survivor and REO Speedwagon. Teamed up with guitarist Johan Thuresson (The Million), bass guitarist Johannes Hansson, drummer Kristian Brun (Scaramanga) and keyboardist Stefan Mårtenson this is one band that would seem to be custom-fitted for the AOR crowd and, if I'm to admit a dirty little secret here (just between you and I of course seeing as we're all friends) that might just include me!